Why the Class of 2013 is awesome!! There are many reasons why the class of 2013 is the best. Even though we have had our part in making trouble, I have found that we, as students, are there for each other. We are always there for each other in any situation and there are so many people who respect and care about others and you. Also, it is such a great environment to make new friends because most students are accepting of others. The class of 2013 will be the first class ever to graduate from the new Hillview. This is important because we will be remembered for years to come. We have the honor to be remembered as great Hillview students. The 8th grade students this year has been able to experience ipads and with the new school will be able to up stairs and when we get the new field will be able to set great examples on the turf. All these privileges help us grow into what we want to become and I know that the 8th grade students will be able to accomplish their goals and dreams. Throughout the past 2-3 years we have grown to know each other as more than peers, we have come to count some as family. That is a great quality we possess so we carry these friends with us our whole lives as someone to turn to, that is something we can cherish forever. Through the drama and the laughs, we as people have shined through and conquered middle school with teachers we trust, and with new found responsibility we are ready to move on to the challenge of high school. I am confident that we will create new memories, both sad and happy, with these qualities that we have inside of us we will get through it strong and shine as people. I really enjoyed this insightful article. It gave me a view into the lives of Hillview 8th graders. I especially like the part about being proud to graduate from the new Hillview! Thank you for writing this thoughtful article. i liked the article, and the part where we stirred up trouble, but you should also have put it in a 6th grade and 7th grade point of view. also, i think you were right about a revolution against the teachers and rule the school! 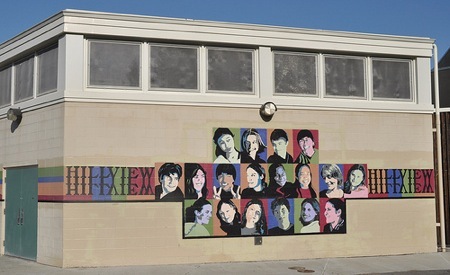 Interesting, 8th grade will be the first to graduate from the new the new school. But class of 2015 will be the first to be at the new school all three years. 10 Ways to Earn Your Block H!